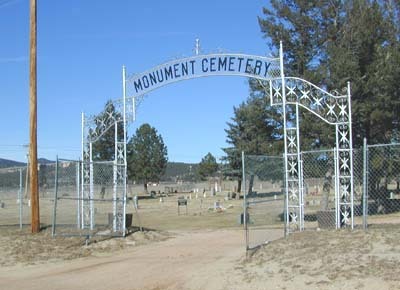 The Monument Cemetery is located one block north of the intersection of Colorado Highway 105 and Beacon Lite Road. Measured by GPS technology accurate to within 10 meters, its coordinates are latitude 39°06'04.1"N by 104°52'01.3"W. It is is maintained by the town of Monument, and its records are kept in the town hall on Second Street. From May to September, the cemetery is open from 8 a.m. to 8 p.m. daily; from October to April the hours are 8 a.m. to 5 p.m. The cemetery overlooks the Front Range of the Rocky Mountains and has mature trees and park benches. It is well maintained. The town shows its pride in the cemetery by maintaining records of its pioneers and war dead and honors these people on Memorial Day. In researching this project, several interesting facts have come to light. According to the town's current cemetery caretaker, Mr. Ron Hilleman, the plots have been laid out twice, which explains why some of the rows aren't perfectly straight. Mr. Hilleman has spent countless hours plotting the cemetery and maintaining the records. Also, many markers show a death date of 1919. Lucille Lavelett's book explains this fact by mentioning the influenza epidemic that year. She also addresses what might be one of the cemetery's most colorful inscriptions. Francis Brown's 1876 headstone reads simply, "He was killed": the result of a cattle dispute.